I can imagine this cavern filled with turkish carpets, torches and people living in community. The underground cities of Kaymakli, Mazi, Derinkuyu and Ozkonak may have been first built by Hitties, but they were mostly used by Christians who went underground for months. Invaders to Cappadocia found only unihabited villages when the citizens went underground. Not only did the cities have sleeping chambers, kitchens, sewage and air shafts, they provided for food storage, wine making, animal stables —even places for newlyweds, children, cemeteries and meetings. The huge underground city of Derinkuyu could house 20,000 inhabitants. Only the first 8 floors have been excavated. 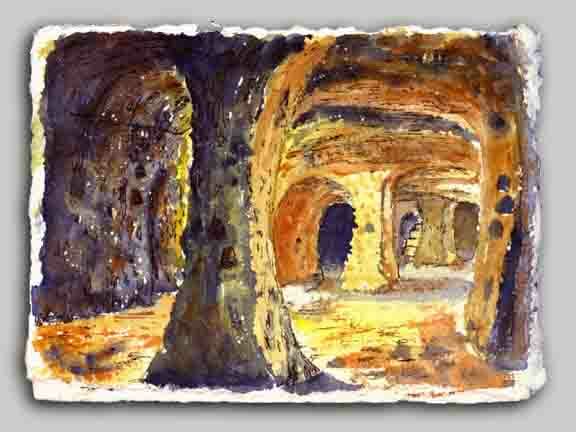 The caves interconnect to other subterranean cities in the area. Scientists estimate 30 other underground cities, may be undiscovered in this area.